Friday evening, Kathleen and I were thrilled to watch our son, Richard, give the class address for the graduating MBA students at the University of Kansas. As Richard said during his address, "this is supposed to be about us (the graduates)." During the one commencement address I have given, I tried to both congratulate the graduates and inspire them about their roles for the future. 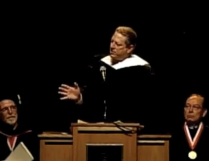 With that in mind, I link to what may be the worst commencement address ever (note: it contains several misstatements of fact).